Theorized nearly a century ago and pursued for decades in laboratories around the world, the metallic hydrogen, maybe is became has been obtained in a laboratory at Harvard University (USA) by Isaac Silvera and Ranga Dias with a method described in a report published in the Archives “open access” arXiv (October 2016) and in a second document of Sciences (26 January 2017).In 1935, Eugene Wigner and Hillard Bell Huntington predicted that at a pressure of 25 gigapascals (GPa), solid molecular hydrogen would turn into a metal. Since 25 GPa is a pressure over 200 times that at the bottom of the Mariana trench, their claim was impossible to verify.The procedure to obtain this material consist in to use a diamond anvil cell (a kind of press), by means a sample of hydrogen is subjected to a pressure of 495 GigaPascal, more or less 5000000 atmospheres, a pressure that in nature is not reached neither at the center of the Earth. Thus compressed, the molecular hydrogen becomes atomic hydrogen, which is a metal.They were able to obtain such a high pressure by crushing the solid hydrogen between the flattened tips of two synthetic diamonds. To prevent the diamonds from cracking, the tips were carefully polished to remove surface defects, heated to remove any residual internal stresses, and coated in alumina, an extremely hard compound of aluminium and oxygen that hydrogen can’t seep through. At relatively low pressures, the compressed solid hydrogen was transparent. As the compression intensified, it began to turn opaque and black. But at 495 Gpa, the hydrogen was shiny and reflective, indicating its transformation into a metal (although the researchers can’t be sure whether it was solid or liquid). TRUE OR FALSE? Several scientists who deal with the physics of high pressures have expressed doubts and concerns about the research and the results announced. The first document, published on arXiv, had aroused some criticism because they are too poor in details about the procedure and interpretation of the result. The second document, the one published by Science, has not silenced the skeptics because adds to the first reports only a few and insufficient details. 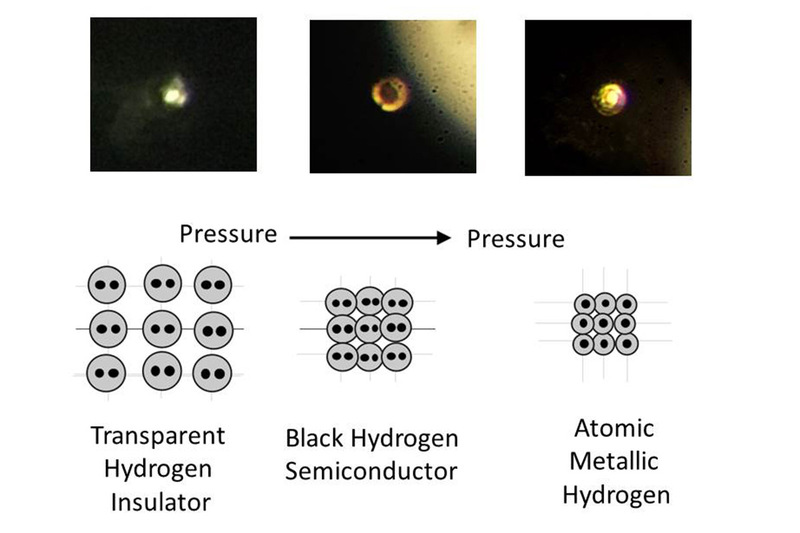 So it is evident that the critics consider the information released by Silvera and Dias insufficient to analyze the procedure, in order to replicate in other laboratories, essential conditions to be validated by the scientific community.The sucitate concerns are understandable in some ways: if the method to produce metallic hydrogen would be validated, and if the new material would be really stable, you deserve much more than a Nobel. As well as a superconductor, this element would have in fact an infinite number of significant applications including transport systems with magnetic levitation, and new electronic devices. It would also be a formidable energy storage: a battery with a capacity proportional to the enormous energy used to create it, capable of powering even space rockets. This entry was posted in Technology & Science and tagged arXiv, Dias, Harvard, Hydrogen, Isaac, metal, Nobel, Ranga, Silvera. Bookmark the permalink. ← What does happen if an astronaut dies in space?